Mohr–Coulomb theory is a mathematical model (see yield surface) describing the response of brittle materials such as concrete, or rubble piles, to shear stress as well as normal stress. Most of the classical engineering materials somehow follow this rule in at least a portion of their shear failure envelope. Generally the theory applies to materials for which the compressive strength far exceeds the tensile strength. In geotechnical engineering it is used to define shear strength of soils and rocks at different effective stresses. The Mohr–Coulomb theory is named in honour of Charles-Augustin de Coulomb and Christian Otto Mohr. Coulomb's contribution was a 1773 essay entitled "Essai sur une application des règles des maximis et minimis à quelques problèmes de statique relatifs à l'architecture" . Mohr developed a generalised form of the theory around the end of the 19th century. As the generalised form affected the interpretation of the criterion, but not the substance of it, some texts continue to refer to the criterion as simply the 'Coulomb criterion'. is the minimum principal stress. 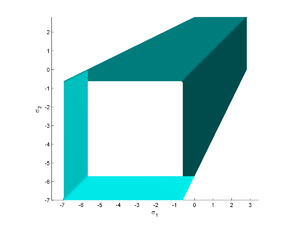 The Mohr–Coulomb failure surface is a cone with a hexagonal cross section in deviatoric stress space. for the six planes of maximum shear stress. The Mohr–Coulomb yield surface is often used to model the plastic flow of geomaterials (and other cohesive-frictional materials). Many such materials show dilatational behavior under triaxial states of stress which the Mohr–Coulomb model does not include. Also, since the yield surface has corners, it may be inconvenient to use the original Mohr–Coulomb model to determine the direction of plastic flow (in the flow theory of plasticity). 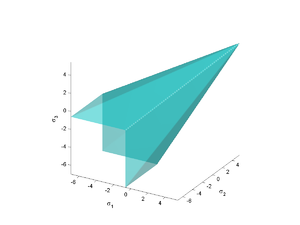 is an appropriate function that is also smooth in the deviatoric stress plane. ^ AMIR R. KHOEI; Computational Plasticity in Powder Forming Processes; Elsevier, Amsterdam; 2005; 449 pp. ^ MAO-HONG YU; "Advances in strength theories for materials under complex stress state in the 20th Century"; Applied Mechanics Reviews; American Society of Mechanical Engineers, New York, U.S.A.; May 2002; 55 (3): pp. 169–218. ^ NIELS SAABYE OTTOSEN and MATTI RISTINMAA; The Mechanics of Constitutive Modeling; Elsevier Science, Amsterdam, The Netherlands; 2005; pp. 165ff. ^ Coulomb, C. A. (1776). Essai sur une application des regles des maximis et minimis a quelquels problemesde statique relatifs, a la architecture. Mem. Acad. Roy. Div. Sav., vol. 7, pp. 343–387.